A runner-up on last year’s Platinum List, Emporium St. Louis landed atop Ladue News readers’ 2017 list of local purveyors for quality antiques. Located on Manchester Road in a distinctive storefront highlighted with pink accents above the doors and windows, the store houses a number of antique dealers and consignment sellers who may be liquidating estates or personal collections. In business since 1956, Emporium St. Louis now also offers a robust eBay presence where furniture, artwork, vintage clothing, housewares and more are available for a fixed price or by auction. Among the popular styles in the emporium, shabby chic continues to be a mainstay of the rotating stock. Customers can find exquisite interior and exterior furniture, unique antique jewelry and an array of home accessories. More than just an antiques store, Emporium St. Louis is a hub for the local fine furniture trade. Pieces are unique and lend statement status to indoor and outdoor living areas. Styles can range from shabby chic to simple shaker to elaborately carved and painted items. 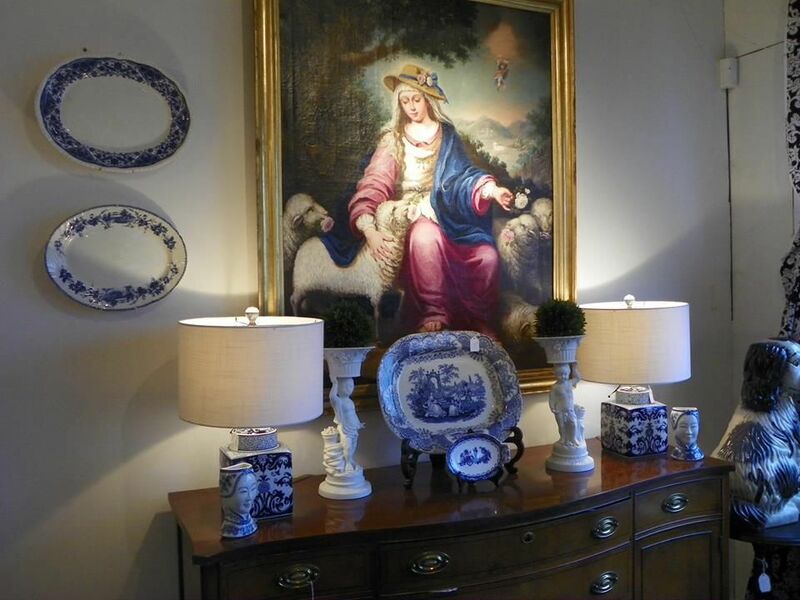 The variety of styles, colors and materials means there’s something for every type of décor, and because the emporium is home to a number of antiques dealers and consignment sellers, new items arrive on a regular basis. Customers can enjoy browsing the store in person or via eBay, where Emporium St. Louis offers furnishings both at fixed prices and by auction. Ladue News readers again indicate their love of the unique with their choice of Marketplace at the Abbey, which specializes in architectural salvage pieces and furnishings made from reclaimed lumber. Customers who buy there can rest assured their neighbors will not own a duplicate item. A relatively recent addition to the St. Louis area home décor scene, Marketplace at the Abbey opened in 2014, featuring a wide array of decorative and practical items, many of which are handcrafted by St. Louis-area artisans. With an emphasis on French country style, springtime décor will bring floral arrangements, housewares and linens to the forefront. In-home design services also are available. Whether working with a homeowner or a business owner, the skilled staff at Savvy Surrounding Style helps create expressive, individualized spaces. Considering residential clients’ lifestyles and personal preferences, designers help create stunningly beautiful and functional décor, guiding client choices on color schemes, furnishings, lighting, accessories and art with each client’s time frame and budget in mind. When interior design and décor choices seem overwhelming, working with the experienced, client-focused Savvy Surrounding Style team can be a lifesaver, whether you’re designing a single room, your entire home or your workplace. In addition to their client work, Savvy supports a different charity each year. For 2017, Savvy staff will be working to support Dirk’s Fund Golden Retriever Rescue – there may even be a dog in the showroom from time to time! Founded in 1947, family-owned RSI Kitchen & Bath is now the largest kitchen and bath design center in the area. With two showrooms in the St. Louis area and a builder selection center in Wentzville, RSI welcomes customers shopping for specific needs or simply beginning to envision the possibilities for remodeling an existing space. A vast array of cabinetry, countertops, appliances, tile, lighting and more are available from some of the nation’s best-known high-end manufacturers. Those planning a full remodel are encouraged to schedule a free, no-obligation appointment with an RSI designer. The company’s website also offers a style-finder feature that can help remodelers or those building a new home to better understand their preferences and hone their choices based on specific design styles. Chesterfield Valley Nursery invites you to “love your landscape,” and the company has been helping people do just that for more than 25 years. What began as a one-man operation is now a full-fledged landscape design and installation firm with 30 employees all ready to help create beautiful outdoor spaces for your home. Whether you need to design and build an entire outdoor living area or just choose some colorful, lush plants from the nursery’s inviting 10-acre garden center, if it grows in the Midwest, Chesterfield Valley Nursery can help you incorporate it into your property.